You are here: Home / Hacks / bad.hack / Texas UMC: Is Proposal Accidentally Ageist? So, yesterday was fun. Over 80 comments on “Over 45? Texas UMC doesn’t want you in Ordained Ministry.” And today, my good friend Josh Hale, who sits on their BOM’s executive committee, posted a clarification of the reasoning. It is a good read, check it out and it helps us give more context to the policy so that we can now more firmly make opinions about it. However, I’m not satisfied that such a policy is not–in fact–ageist in effect even if not in intent. [J]ust as psychological, medical, educational, theological, and vocational differences necessitate instruction about how Boards of Ordained Ministry approach specific issues, age does play a role. Rising pension and health care costs play a role. Rising costs in university and seminary education plays a role. Geographic relocation plays a role—my conference has no university Senate approved theological schools in the bounds of the conference. None. If you think these issues don’t play a role, or they shouldn’t, then you live in a fantasy land. We have real-world constraints on the way we do ministry and church that require real-world solutions. This isn’t a gate through which everyone must pass, but a concern that does need a conversation and maybe, yes, even encouragement to consider a different route. So to the Texas Annual Conference BOM, real-world concerns necessitate checking on the candidate to make sure they’ve done their due diligence. And I agree completely, each candidate comes with demographic challenges. But the question is: why codify this one as policy? To get a clear picture of the effect of this proposal…substitute the words “Candidates who are African-American” or “Candidates who are female” for every “Candidates over age *” on the spreadsheet. This is an issue of discrimination, not pensions and guaranteed appointments. Candidates who are women should be encouraged to pursue other expressions of ministry. They need to show their due diligence that they are prepared for people leaving their church when they first arrive, that telemarketers will ask to speak to the “real” pastor, that their apparel will be critiqued as much as their sermons, and that they will not likely be considered for the largest churches. They need to show they have thought through this in ways that men do not. Candidates who are ethnic minorities should be encouraged to pursue other expressions of ministry. They need to show their due diligence that they are prepared for racist comments by parishioners (intentional or unintentional), that their church metrics may not add up due to immigrants not wanting to “join” a church on paper, and that they will be tokenized and expected to speak on behalf of their entire race. They need to show they have thought through this in ways that Anglos do not. Candidates who are handicapped should be encouraged to pursue other expressions of ministry. They need to show their due diligence that they are prepared for parsonages that they can’t live in, for people to question their ability to visit them in the hospital or at home, and for higher medical bills. They need to show they have thought through this in ways that not-differently-abled (totally not a PC term) do not. Candidates who are progressive should be encouraged to pursue other expressions of ministry. They need to show their due diligence that they are prepared for writing “extra” papers each year for the BOM clarifying their not-cookie-cutter-theology, to be judged based on the HomoLiberal school they went to (*cough*Boston U*cough*), and to not be sent to the largest churches due to a theological mismatch. They need to show they have thought through this in ways that Traditionalists do not. Sorry, there’s a whole lot of me in that paragraph. 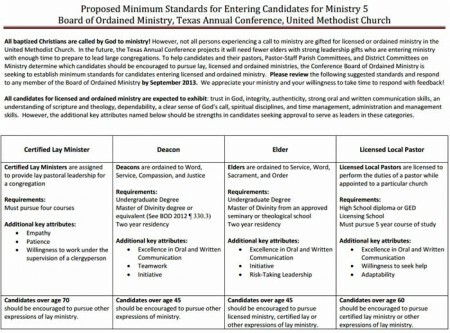 Perhaps in the same vein as the country song “Accidentally Racist” which turns out to be racist (made fun of by Stephen Colbert here in the brilliant “Oopsy Daisy Homophobe“), the Texas Annual Conference UMC is trying to deal with an issue (clergy age stratification) in a way that accidentally is ageist. When you codify a particular demographic as needing to show due diligence in ways that other demographics do not, then your policy is…well, accidentally discriminatory. In my opinion. The first blog prompted much conversation on many different sites yesterday. Of all that was mentioned, it’s possible that my biggest disappointment was learning that this proposed policy has been in existence for quite some time (some say more than a year), has been discussed by board members and others in positions of power, yet has been tweaked very little since its birth. If this really is the 6th or 7th draft, as some have said, that means that the age discrimination it includes has passed muster with a lot of folks – certainly not everyone, but a lot of folks. It makes me sad. The substitutionary language that you provided in today’s blog (thank you, Cheri) is spot on and I hope will be taken into consideration. Sixth or seventh draft? Oh, my…. If they don’t get that this IS agist, that people aren’t seeing things that they didn’t put into it themselves, then they have an even bigger problem than I thought. One more time–thank God my conference hasn’t done this to me. It’s simply ageism, pure and simple. And, as the article below might indicate, some humans tend to flourish after 50. President Ronald Reagan was an actor and wasn’t elected to public office until he was 55. (Mental Floss) — Sadly, the down economy has put a lot of workers over age 50 in the unenviable position of needing to find a new profession. Don’t believe that old cliché about middle-aged dogs and new tricks, though; lots of wildly successful people found big success in careers they began after their fiftieth birthdays. Harland Sanders was no slouch as a young man, but he didn’t become the string-tied chicken mogul we know and love until he was 65. “The Colonel” had a relatively successful restaurant and motel on U.S. 25 in Corbin, Kentucky, but when Interstate 75 opened seven miles from Sanders’ restaurant, his business begin to dwindle. You may not recognize Cover’s name, but you’ve surely heard of his invention, the Taser. Cover spent most of his career as a nuclear physicist who worked in aerospace and defense, including playing a significant role in supplying parts for NASA’s Apollo project. Whether or not you know it, you probably owe Hoyle a tip of the cap each time you reach for a deck of cards. The Englishman is considered to be the world’s first technical writer on the rules of card games, and he didn’t put pen to paper as a young card sharp. Hoyle was around 70 years old when he first began recording the rules of various card games in 1741; over the last 27 years of his life, his smash hit “A Short Treatise on the Game of Whist” went through over a dozen editions. Wilder’s “Little House on the Prairie” may be some of the world’s most beloved children’s books, but she was no spring chicken when she sat down to write them. Wilder didn’t publish her first novel until she was 65 years old, but she still managed to crank out one of the most beloved series of all time. You don’t have to start early to become the richest man in the world. Mori was an economics professor until he left academia at age 55 to become a real estate investor in 1959. Mori had recently inherited a couple of buildings from his father, and he jumped headfirst into Tokyo’s real estate scene. Mori started his second career by investing in the Minato ward where he spent his childhood, and within a matter of years he was presiding over Japan’s real estate boom. When Mori died in 1993, he was Forbes’ two-time reigning world’s richest man with a net worth of around $13 billion. He was something of a Japanese precursor to Warren Buffett, though. Mori never seemed totally comfortable with the fame and fortune his second career won him. He dressed traditionally, abstained from alcohol, and lived a fairly modest life. Anna Mary Robertson Moses is one of the biggest names in American folk art, and she didn’t even pick up a brush until she was well into her eighth decade. She was 76 when she cranked out her first canvas, and she lived another 25 years as a painter — long enough to see the canvases she had sold for $3 fetch prices north of $10,000. Sure, Reagan had been no slouch as an actor, but he wasn’t elected to his first public office until he was 55 years old. In 1966 Reagan won California’s gubernatorial race by over a million votes. No offense, Glen, but I don’t find this kind of argument compelling. I see it, instead, as the exception that tends to prove the rule. The ten examples you cite from Mental Floss are precious few among the millions (billions?) of humans who have not achieved anything more spectacular after 45/50/55/60 than they had already achieved prior to that age . . . or at least shown promise of achieving. Ten times as many examples, 100 times as many examples would still be statistically insignificant. Not to mention the distinct possibility that these largely individual, entrepreneurial achievement are not comparable to being approved for ordained ministry–i.e. they are apples and oranges, so the examples are not relevant. But let’s assume for the moment that the argument (1) does have merit and (2) applies to the situation in the Texas Annual Conference. Since the proposed policy doesn’t preclude the approval of ministry candidates over 45 years of age, presumably any promising Methodist Grandma Moses or Colonel Sanders who earnestly desires to go through the discernment process leading to ordained ministry would receive every consideration possible from his or her dCOM and BOM. Of course, Grandma would already be beyond mandatory retirement age before she started, and the Colonel would be unlikely to finish the process in time to be ordained before being required to retire. Some of their slightly younger compadres would no doubt be approved–in spite of the policy–and go on to have distinguished–if short–careers in ministry. Nothing in the language of the policies precludes this possibility. You or others might say, true, but it does discourage older candidates. Personally, I don’t have a problem with that. I wish we tried to “discourage” more of our candidates, regardless of their age. By “discourage” I mean level with them about the realities of serving in ordained ministry in the UMC and make them truly search their hearts in the light of those realities. That way, those who complete the process would be those whose sense of having been called can withstand trials. Don’t get me wrong. As I have said before, I have my own issues with the policy. But I hope the discussion of its merits and faults can avoid cliches, truisms, and false analogies. By the way, for those who don’t know me, I am just a little shy of 60, have served in the TAC for 37 years (tho I am currently on leave of absence), and have known the sting of ageism personally. Well done, Jeremy. Thank you again for bringing this to light. Perhaps the standards should just read, “Young and pretty boys only.” Don’t get me wrong: I appreciate these young men answering this difficult and challenging call. Yet I wonder how many, placed when yet untested and unformed in high prestige, high pressure, high visibility pulpits, will end up in terrible trouble. When that happens, it is a loss for everyone. 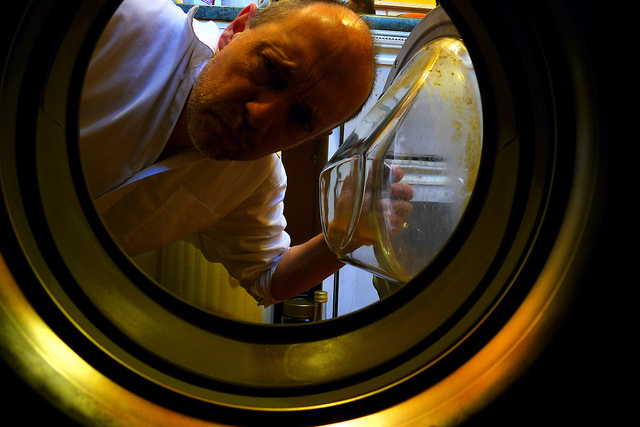 I think there is a considerable amount of presumption that a person who is 45 and considering a change in vocation has not already seriously grappled with the stark realities of this kind of mid life vocational transition. In any BOM process if it is clear that the individual candidate hasn’t been grappling with the issue then it is a red flag to begin with. This is not a problem for candidates for ministry as much as it is for the institution that is getting consultation metrics that are not normative in a ecclesial setting. This might be well meaning policy but it really doesn’t stand up to muster to even be presented and it makes the BOM of the TAC look bad as a representative body of the UMC. The amount of distrust and disappointment among the clergy in the TAC is large. UMC and Boards of Ordained Ministry are grabbing at all kinds of straws to grow the church and be able to fund are ministry. Whether it is doing away with guaranteed appointment or keeping them young or keeping them straight we are not asking the right questions. DCOM is where the most significant discernment happens not Board of Ordained Ministry. The church needs faithful, competent, theologically sound pastors (and much more). Being ageist is not the new save the church answer. I’m in my 3rd year as a DS, and the diminishing resources of congregations and the rising costs of clergy benefits is something I have to help congregations with everyday. Congregations, in trying to be faithful to being Connexional, have to make increasingly difficult decisions where their budgets and staffing needs are concerned. When you look at clergy salaries and benefits, it is often the largest expense in a small church’s budget, and in the conference I serve, is 40% of the total conference budget. That does NOT include General Church apportioned items dealing with minsterial education and support of HIgher Education and Ministry. In our conference, there are 300-some clergy, and 80,000+ laity. When you think about it that way, we have a lot of resources devoted to clergy as opposed to laity. When it comes to clergy and clergy benefits, educational costs have to be considered too. Endowments at private institutions are drying up, and seminary isn’t getting any cheaper. These things, along with a diminishing denomination in both number and resources sets us up for a perfect storm of collapse. So I would go even further than some of the conversations in these last two blogs: the UMC may need an “alternative” way of educating clergy. I’m not advocating that we have an ignorant clergy – but I am raising the very real possiblity that without more alternatives, we may face a real dilemma of a denomination that has clergy requirements that it can no longer offer. It is already difficult enough for younger clergy to handle the debt load of seminary paired with minimum salary appointments. Is it moral to do that to older students who may never get out of debt? Certainly, God uses people of all ages, and is never finished with us. And in an ideal environment, money, age, and time would not be obstacles. But until we change our educational and Disciplinary requirements – or we grow in numbers and resources – we are going to have challenges that will frustrate us. It may be that this is less about ageism and more about clericalism. I’m not anti-clergy; I’m one of them. But a lot of our structure is built to support us – and the resources are diminishing. Jeremy always challenges us. Good writing, brother. Ageist? Yep! Disqualifies Messiah Yeshua (Jesus) who was already middle aged when he was called! Not to mention Moishe (Moses)! Not to mention. Our denomination is peopleated with Baby Boomers! Older folks like me! I was a “second career” seminarian and pastor which, I believe enabled and enhance my pastoral ministry! Speaking as a 58 year old, life-long UM, I can tell you that this is “no church for old men.” It looks from here that the whole church is prepared to sacrifice itself on the altar of youth. Sure, the church is aging. Sure, fewer and fewer younger people are coming into the church. But, is the way forward to abandon the middle-aged and older? The subtle message to everyone coming through the door is “this church wants you if your are under 40, but would prefer you go elsewhere if you are over 45.” Guess what, eventually, everyone gets to be 40, or 50 or 60! If this is the future, no thanks. I signed on for a lifetime of faith and service, my church was supposed to reciprocate. But now, in the name of institutional survival, it will now break it’s part of the bargain to save some money? Shame. We can’t substitute gender or race here because: a) That’s irrelevant to the issue at hand; and b) Everyone ages — it’s universal. Not everyone is female, minority, etc. A modest proposal as this conversation continues: Can we please break the 1970s paradigm of liberal/progressive thinking when we consider the merits of this plan? Do we have to jump to an “-ism” immediately? I know we struggle in our society when the continuing presence of many -isms, but those of us sitting on the outside of Texas Conference could wait, learn more, and then consider whether an -ism is present or whether it’s something else — like maybe just a dumb idea.